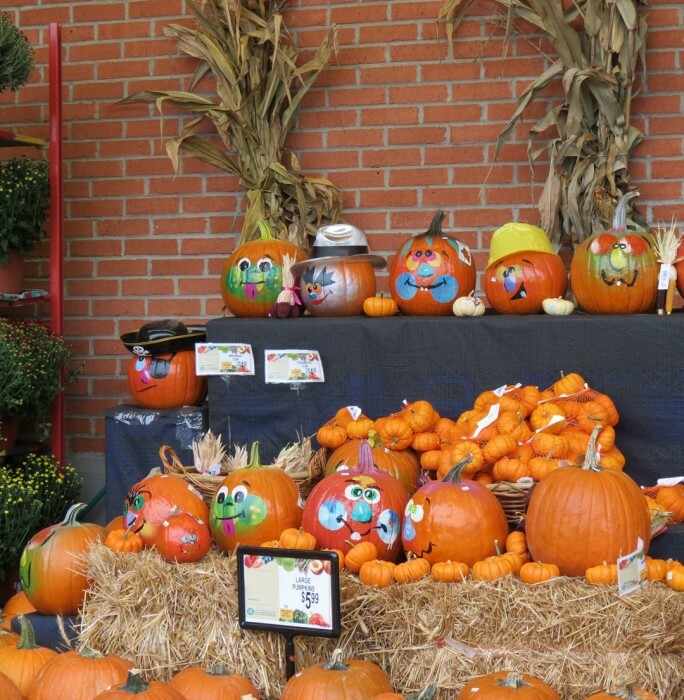 Signs of fall are everywhere, from the pumpkin display at the grocery store to the leaves that are beginning to turn gold and brilliant shades of red. 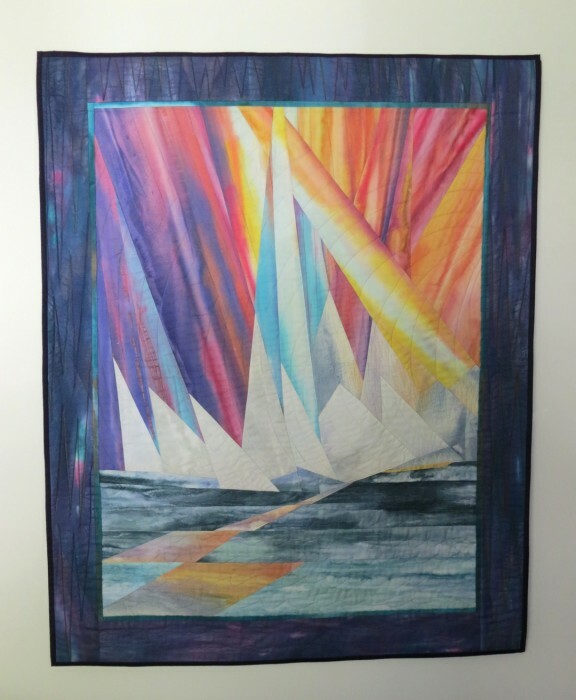 Janice Kelly showed off the “Sailing Away” quilt she made from my pattern that was published in Quiltmaker magazine. 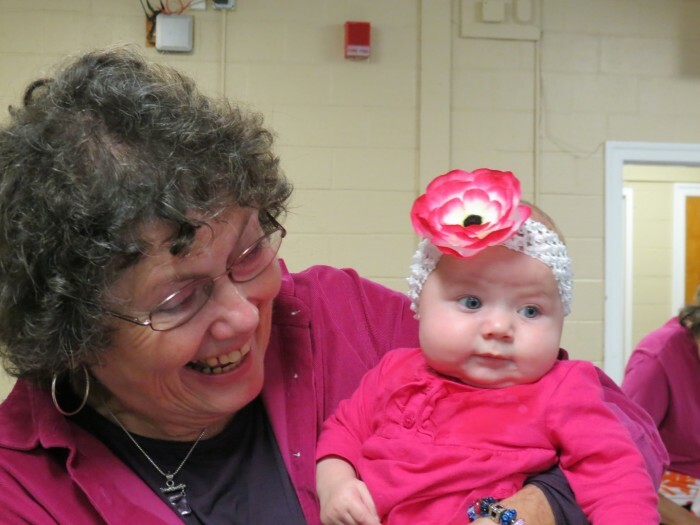 And our youngest quilter was only four months old! Her grandma was babysitting that day and she was a doll and really good in class. What fun we had! 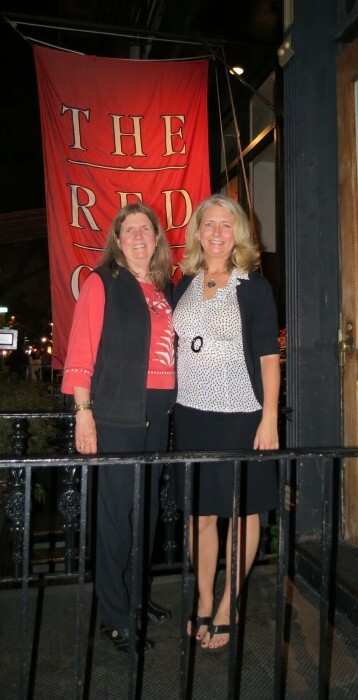 Many, many thanks to Gayle Brown, the outstanding program chairwoman for the Connecticut Piecemakers, who offered to drive me into New York City so I could have dinner with my daughter, Christi! What a treat! 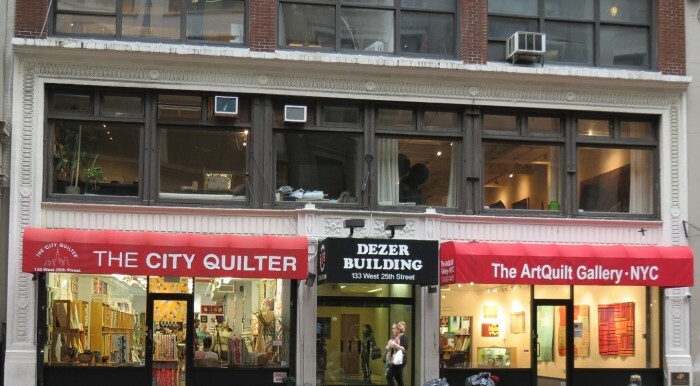 Our first stop was The City Quilter ! 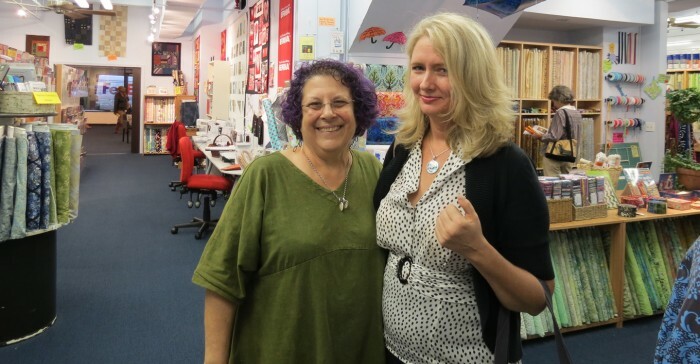 I got to meet Cathy Izzo and her husband and learn about the history of this remarkable shop. It is a must see if you are in NYC. 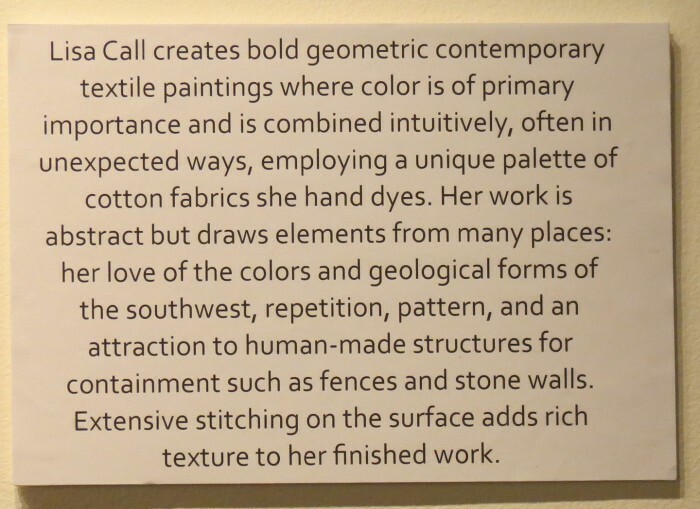 The gallery featured the art quilts of Lisa Call. 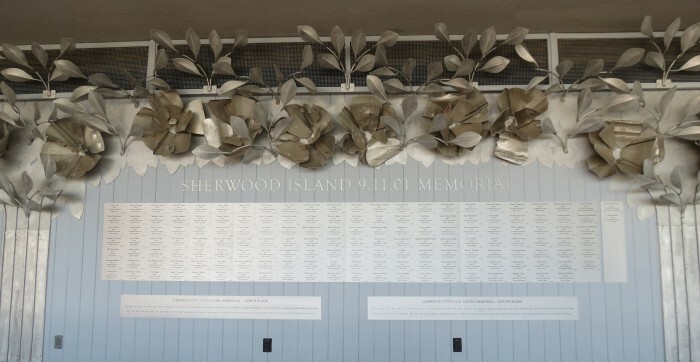 Below are just a few of the works on display. 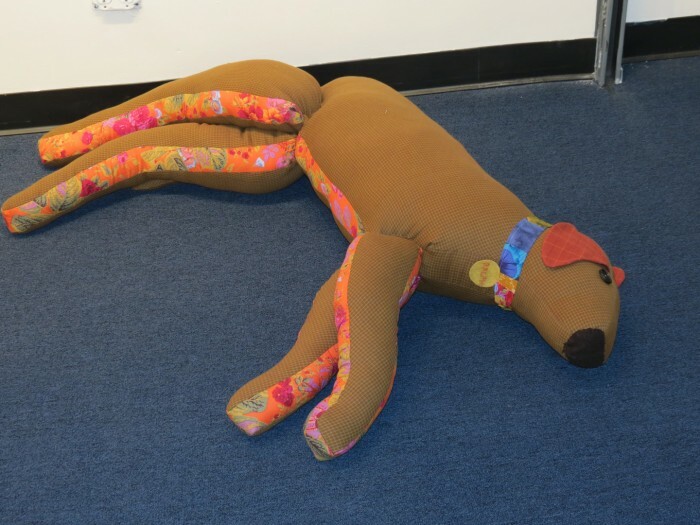 The gallery even had the proverbial carpet dog lounging in the corner. Imagine my surprise when I met fellow teacher, Emily Shuff Klainberg, who was setting up for a class that evening. And the. . . .
My daughter, Christi Garber, arrived at the shop — to shop!! She’s taking classes at the Fashion Institute nearby! But, by far and away, the highlight of my day was getting to have dinner with Christi and friends. It was the perfect day! Good-bye New England! It was fun! Now, on to Memphis for a different kind of adventure. 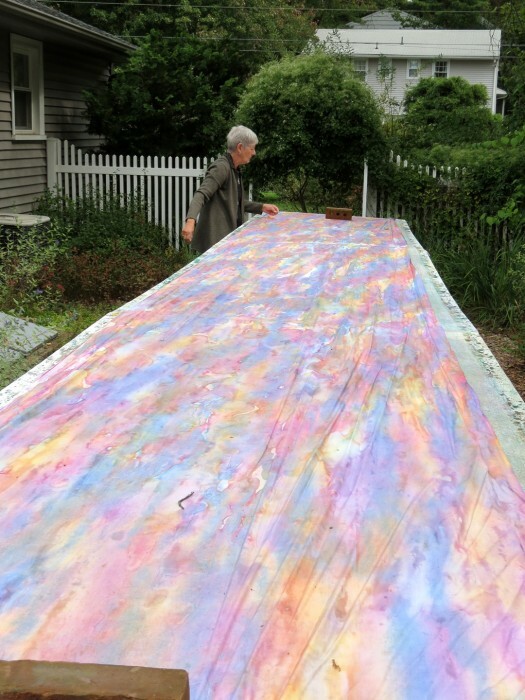 This gorgeous quilt, called Nebula, was created by Barbara Daly Blanchard who took my class in Lancaster in 2010. 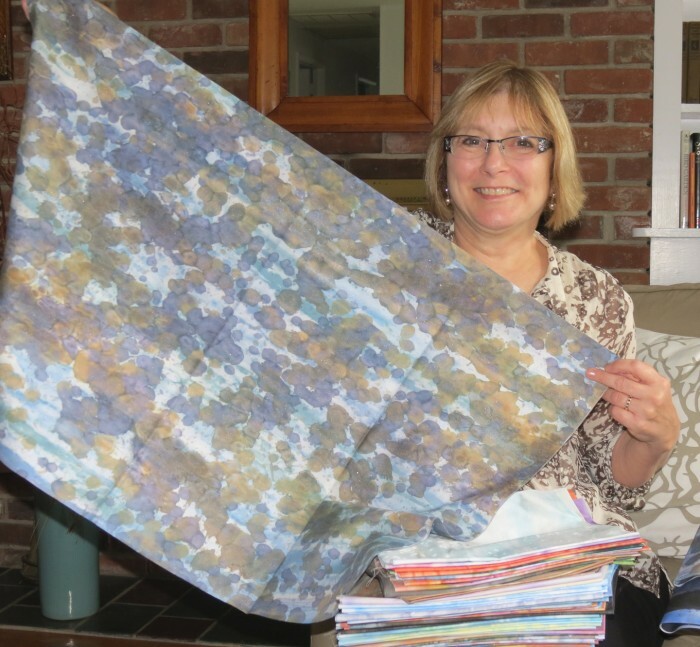 “Nebula was created for a fabric challenge. 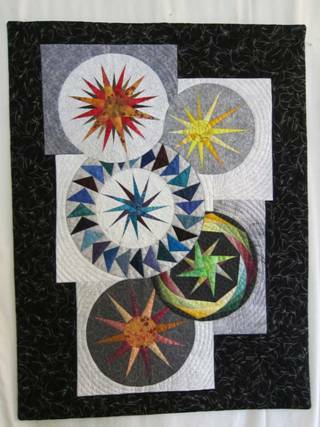 I’d wanted to do a quilt with a collection of intersecting circles for some time, and thus Nebula was created. I began by drafting the circles before I worried about filling them, which was comparatively easy. 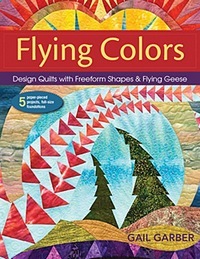 The circles of flying geese and spirals were a further attempt to add complexity. 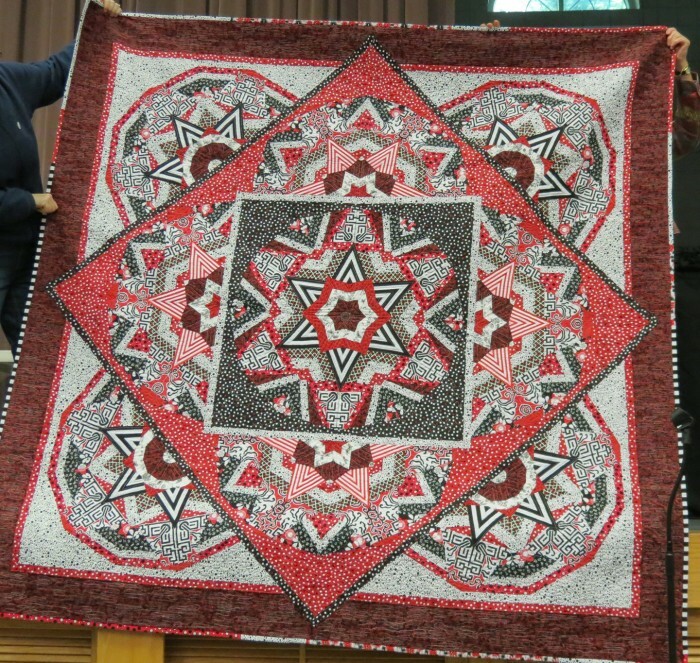 The entire quilt was pieced, with the exception of three center circles, two in the top two stars, and one in the bottom star – piecing them was simply out of the question. 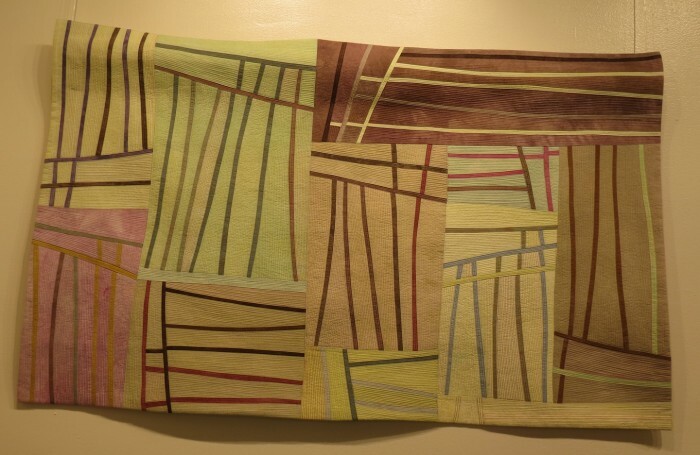 The squares were drafted last as an attempt to add some color contrast and geometric diversity. 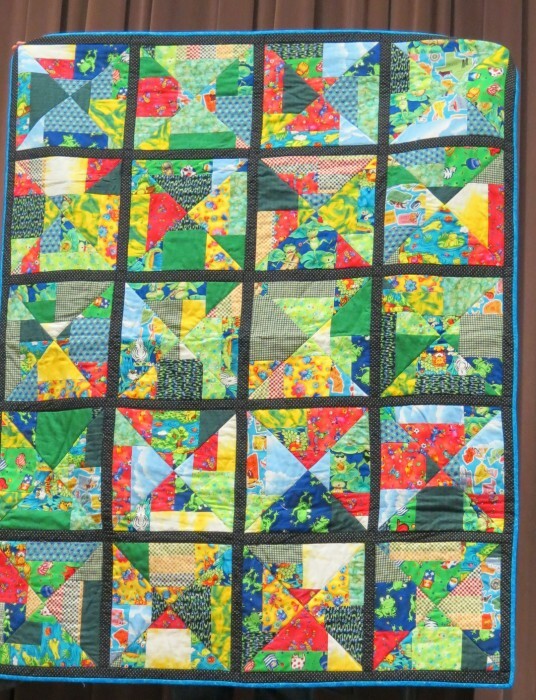 This complex quilt is only 25″ by 35″! 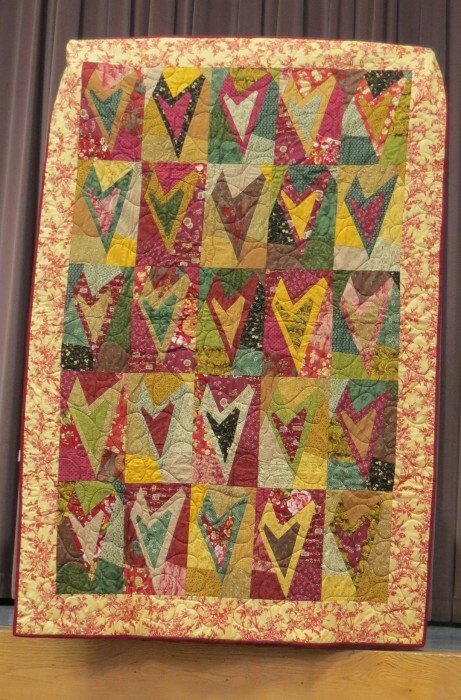 Barbara also shared that she has entered the quilt in two different shows and received quite different comments from the judges. 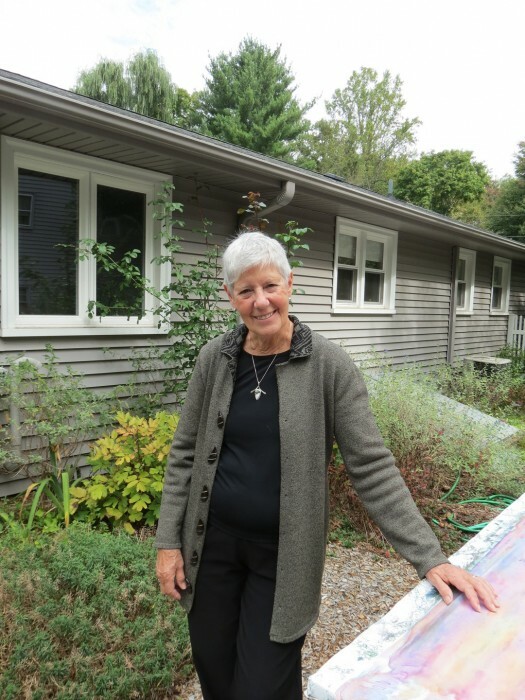 I think all of us who have entered our quilts in competition can relate to what Barbara experienced. We shouldn’t let critical comments hurt our feeling or impede our creativity, but we should try to learn what we can from them. 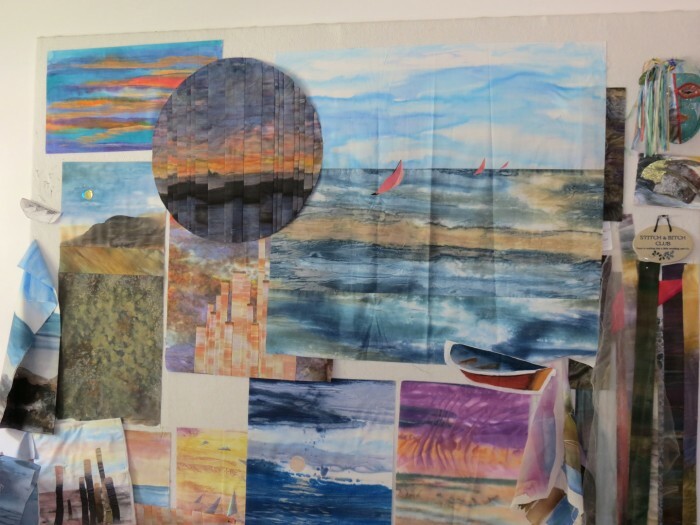 On a personal note, I have been asked to judge a number of shows and I can tell you from experience how hard it is to choose between the many beautiful quilts on dispolay and to put my personal preferences aside while judging. 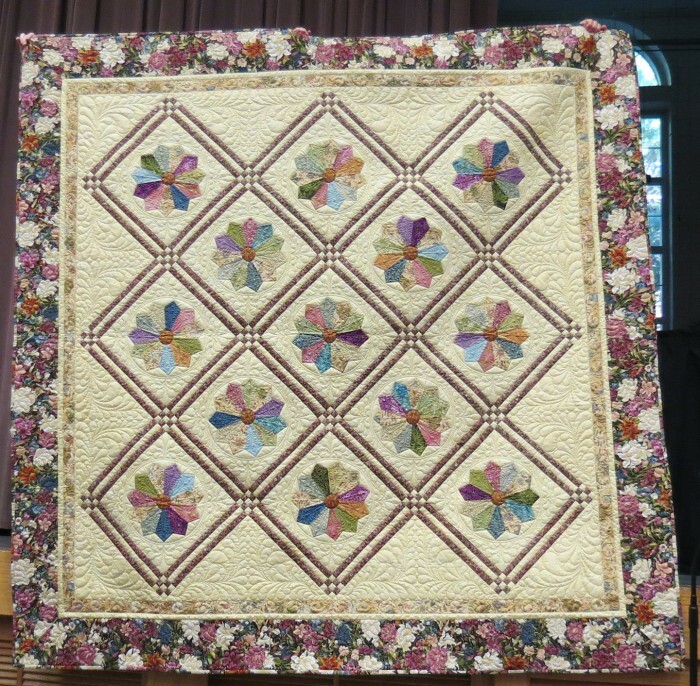 Good luck to all who enter their quilts in shows! 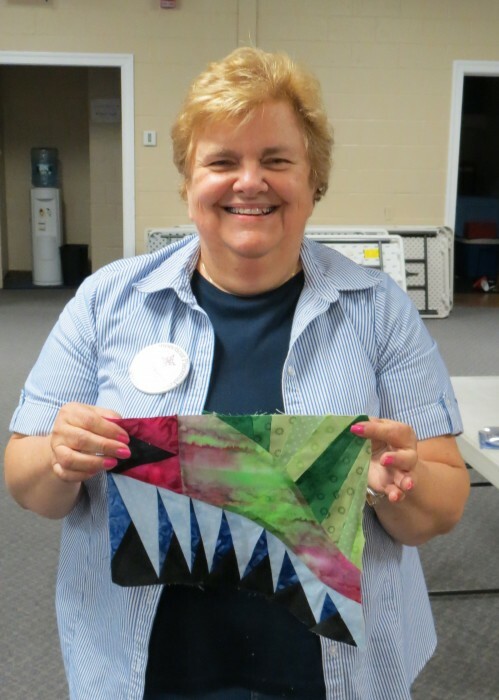 Thanks Barbara, for sharing your beautiful quilt with us. 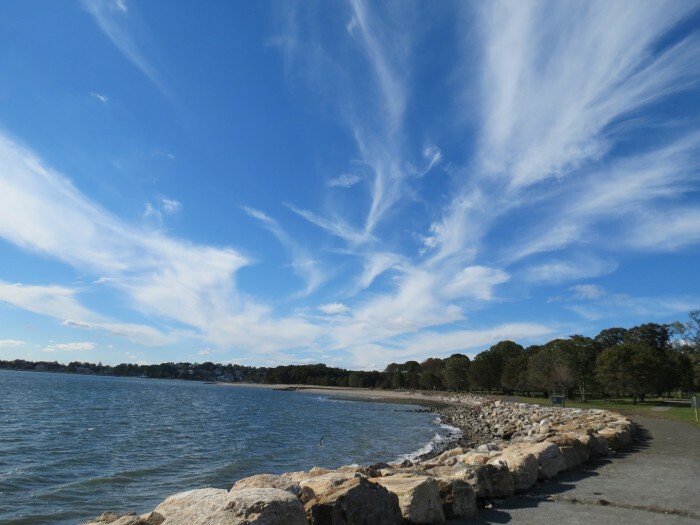 It was a gorgeous afternoon at Sherwood Island State Park in Westport, Connecticut. 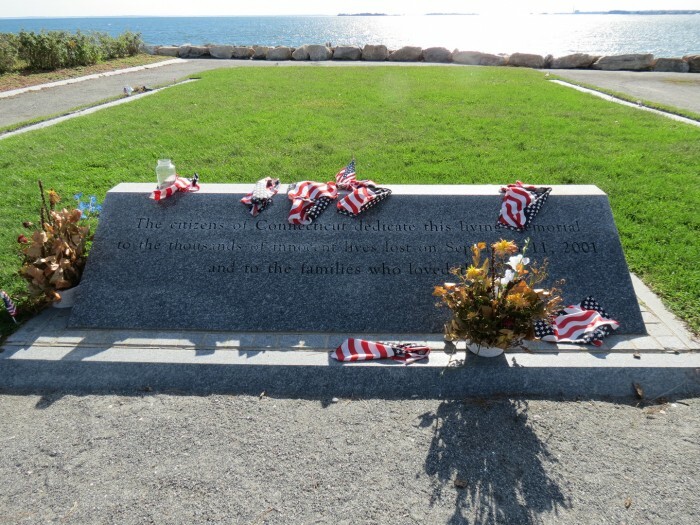 Gayle Brown, program chair for the Connecticut Piecemakers took me out there to see the 9/11 Memorial for victims that were residents of Connecticut. 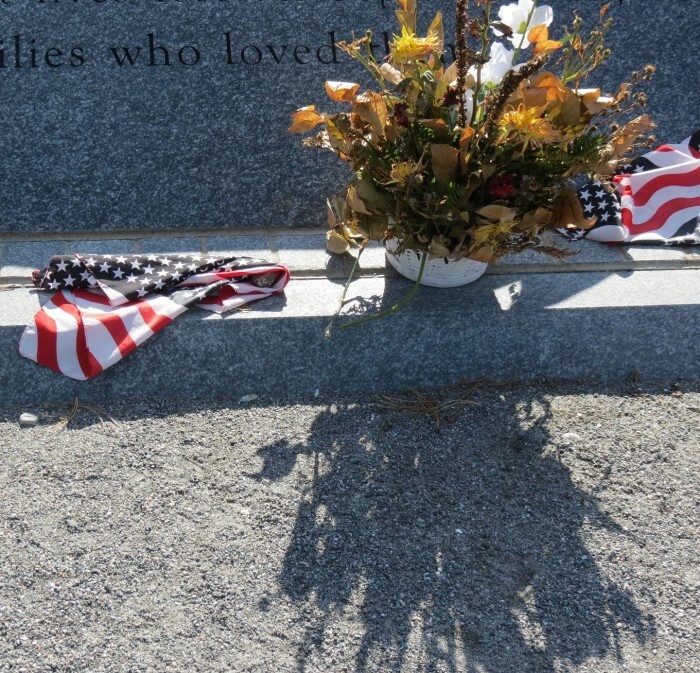 It was very moving. 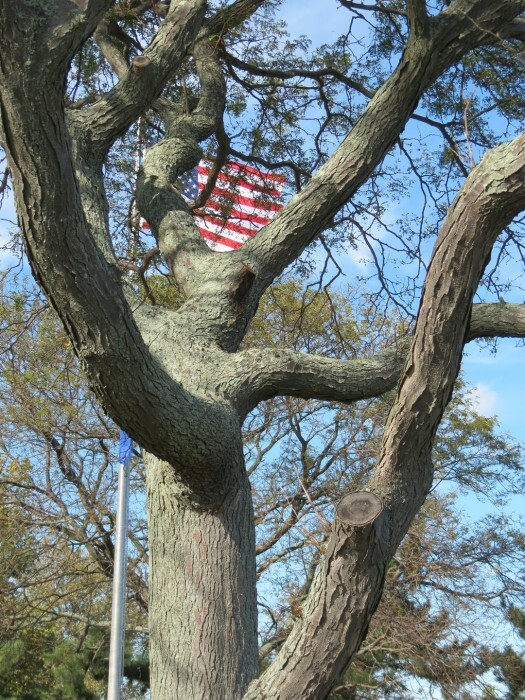 It was to this location that many CT residents came to watch the fires burning across Long Island Sound on that terrrible day. 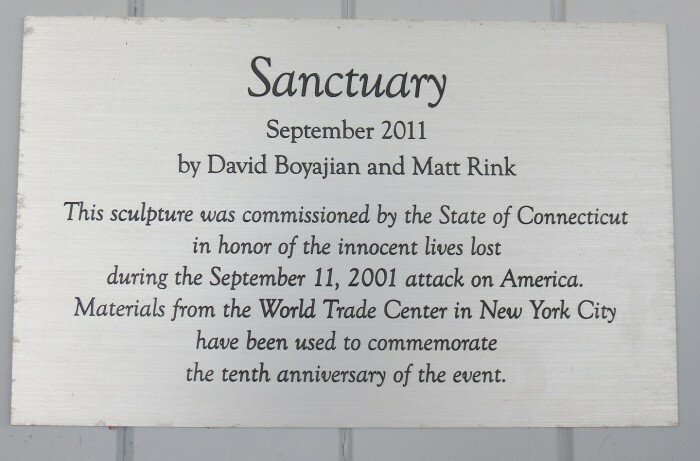 The flowers that surround the name plates of those who perished are made from the rubble of the World Trade Center. 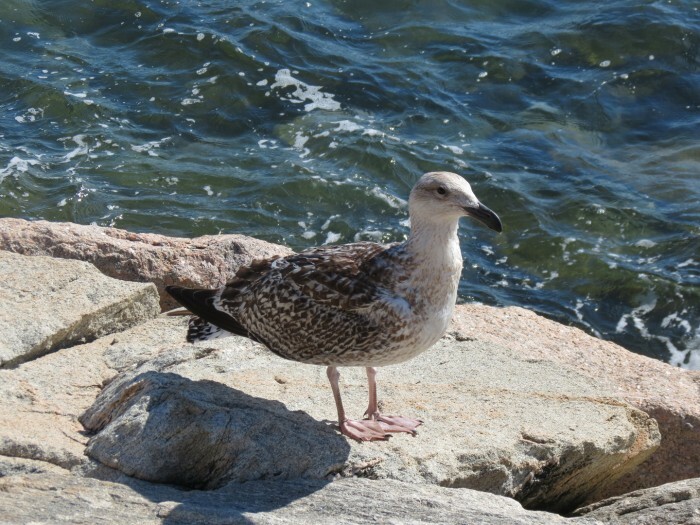 A juvenile Herring Gull basked in the sun that afternoon. 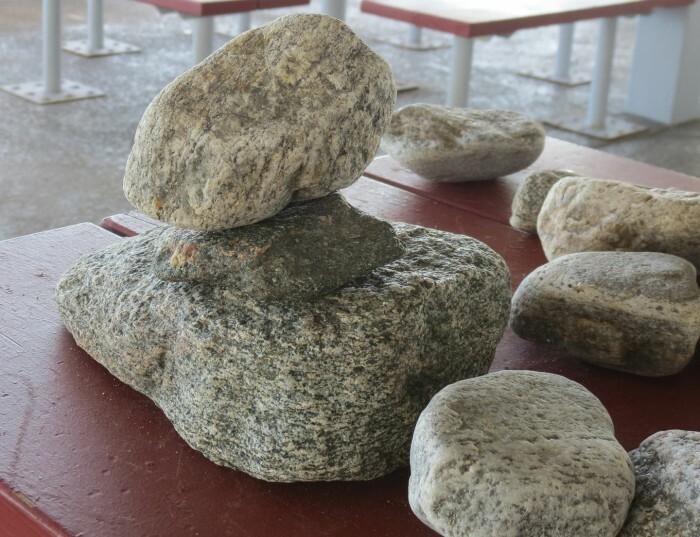 . .
and someone had built a cairn from beach rocks on the picnic table . 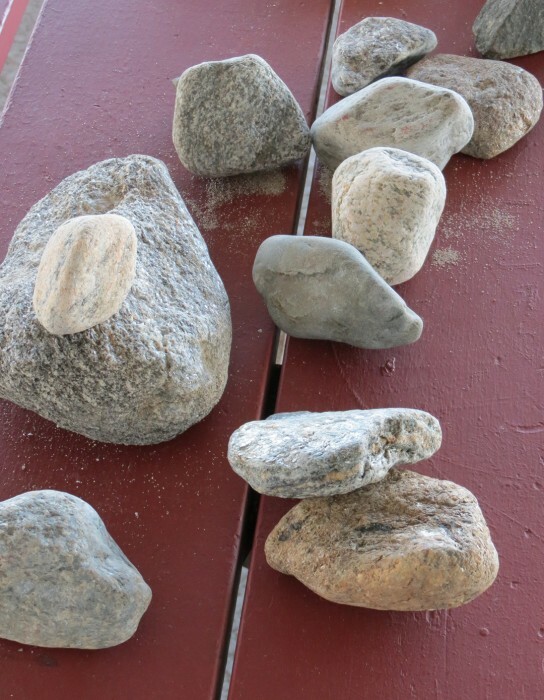 . .
and arranged rocks in a row, evidence left by others who had visited the site, possibly children. I loved the whimsy of this one! Such fun we had at the guild meeting! 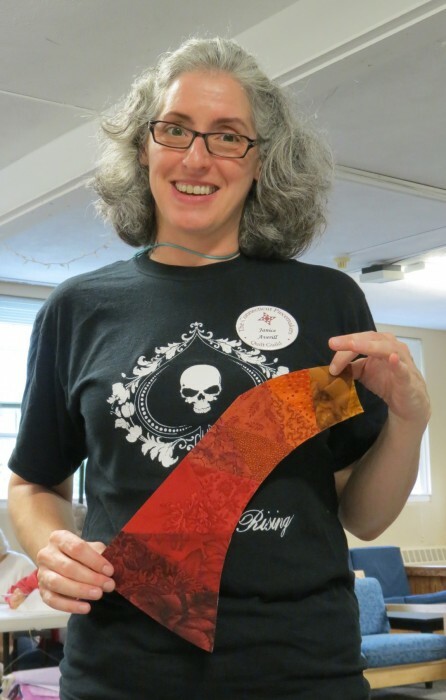 Show and Tell is my favorite part of every quilt guild meetings. 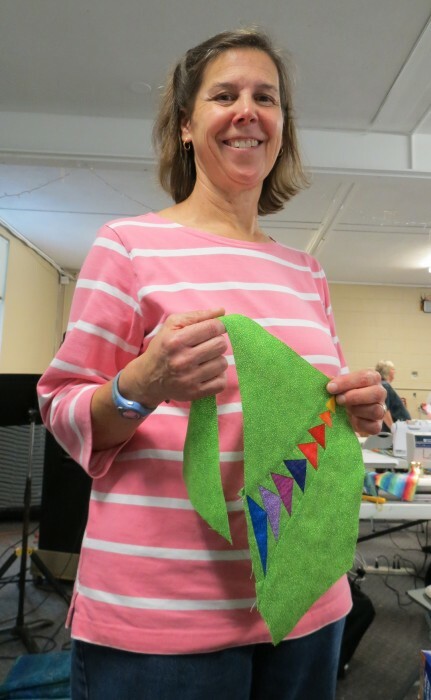 The Connecticut Piecemakers have some incredible quiltmakers among them and show and tell was spectacular! 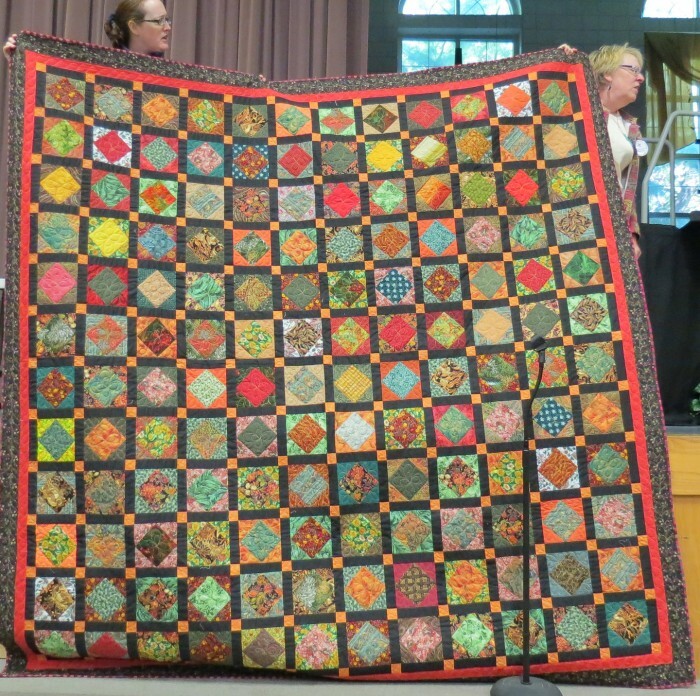 Here are just a few of the cool quilts that were shown at their October 2012 meeting. 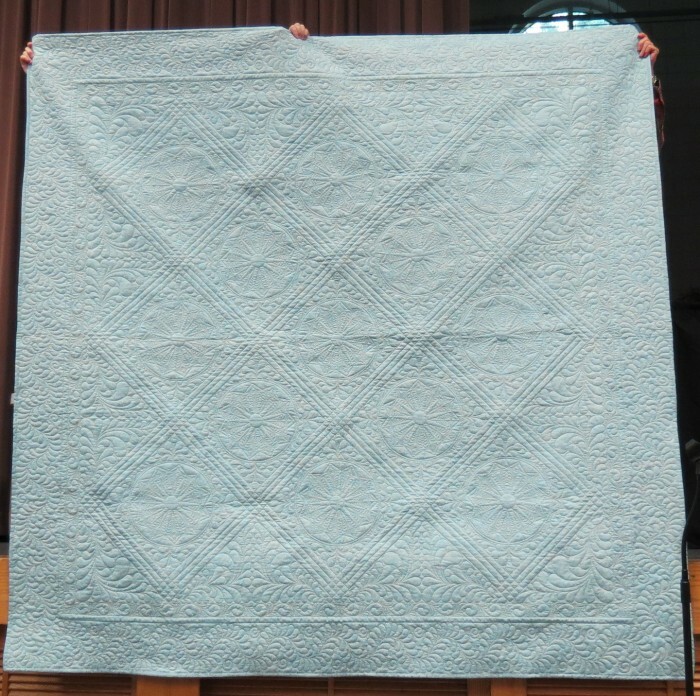 The Dresden Plate quilt was created by Nicki Johnson. 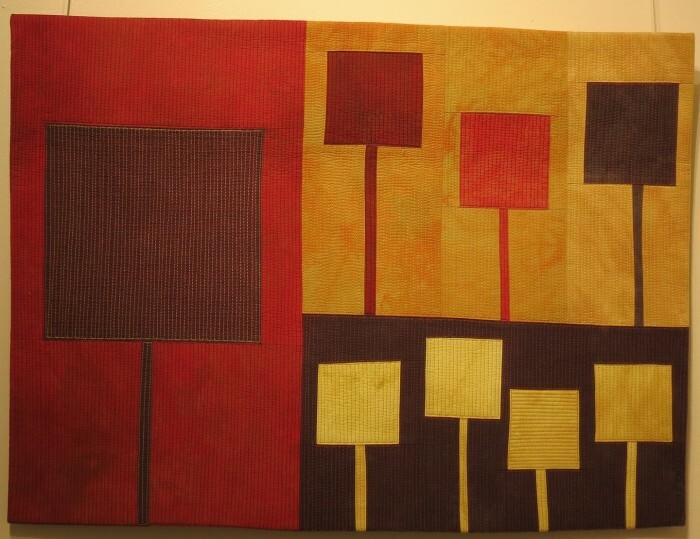 Check out the back view of this quilt that shows off the extensive quilting. Found wadded up in a basket in a thrift store, this quilt top was purchased for $5! What a steal! 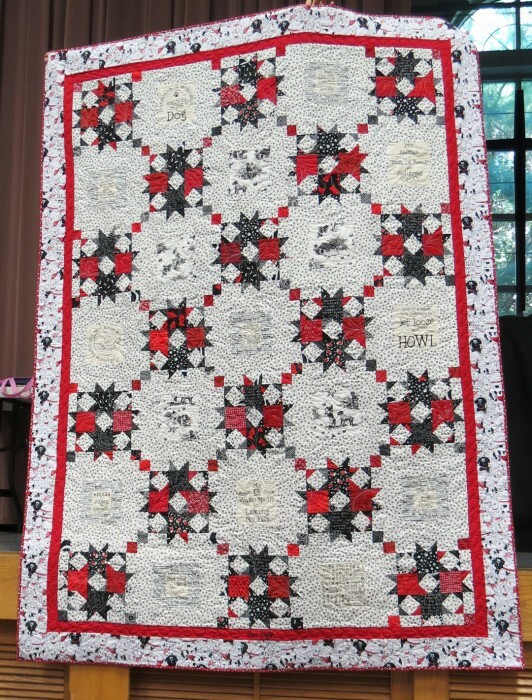 Red, black and white quilt! A creation by Phil Gold. A beauty created by JoAnne Fabry and Lee Hicks. 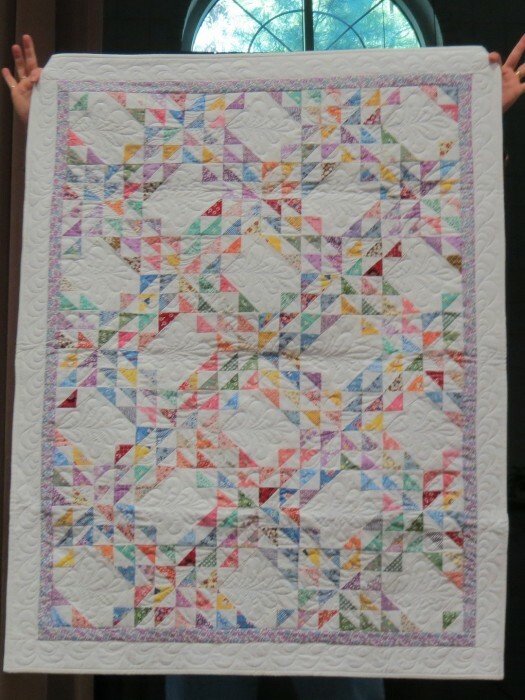 The blocks were discovered when Lee held a sale of her fabrics and JoAnne volunteered to stitch them all together! 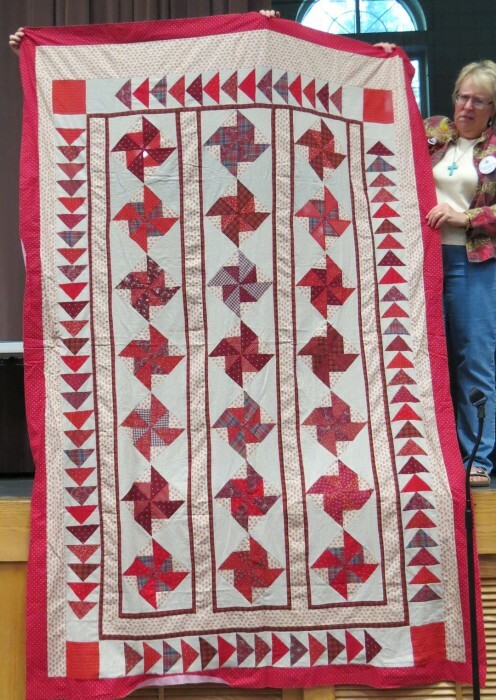 One of the Connecticut Piecemakers Charity Quilts, stitched by Kathy Chisholm. Baby Quilt for a very lucky babe! Moving on down toward the southwestern corner of Connecticut, my day-hostess Gayle Brown, of Connecticut Piecemakers, took the time to show me some of the unique architecture of the area! 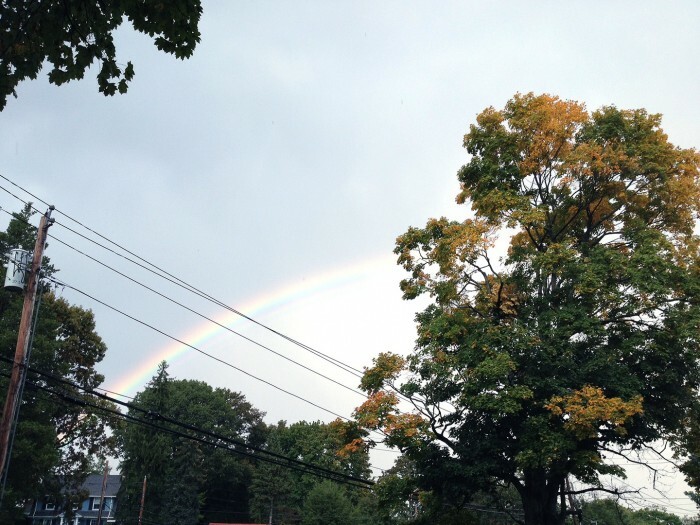 Although it was a rainy afternoon, the highlight was this incredible double rainbow. 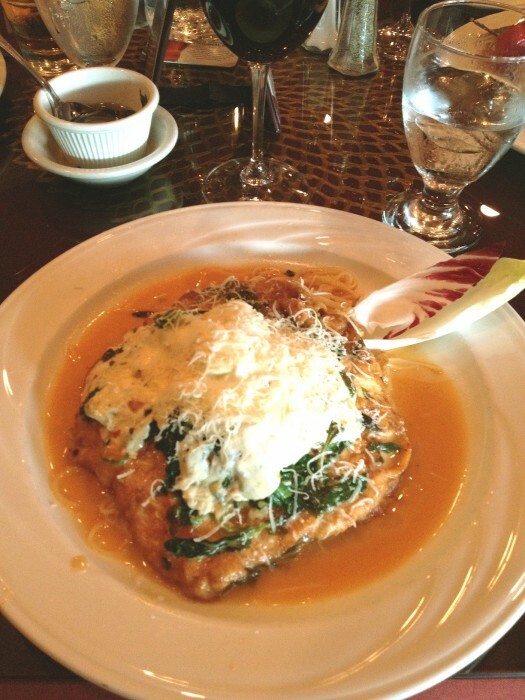 They have some amazing Italian restaurants in this area. Gayle, her husband Kent, and I dined at Mancuso’s Restaurant and Bar in Fairfield, my second stop on this trip. It’s going to be hard to control my weight on this trip – for sure! Yumm! My first trip to Connecticut has been marked by some real highlights! First of all, I discovered that one of my favorite artists, Mickey Lawler, of SkyDyes, lives right in Hartford. 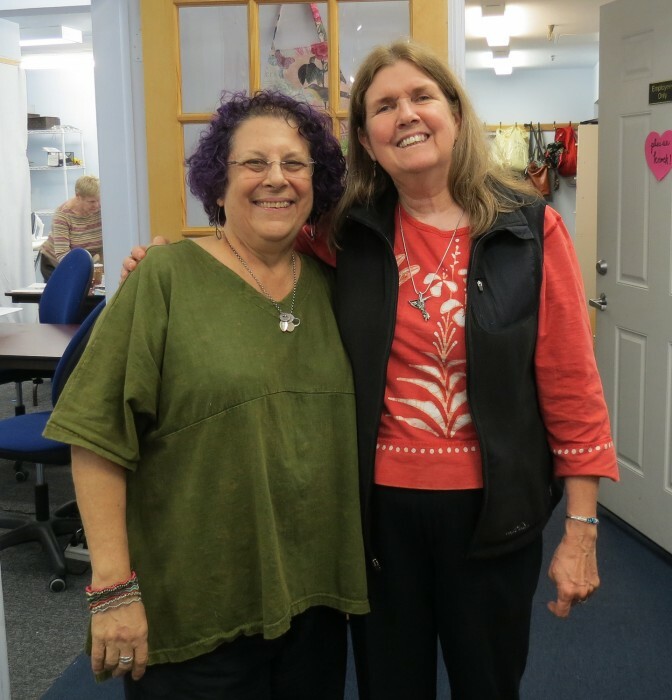 Better yet, I got to visit with her on my first free day, after I taught a class for the Apple Valley Quilters in Southington. Above is one of Mickey’s fabulous quits. It hangs in her living room. 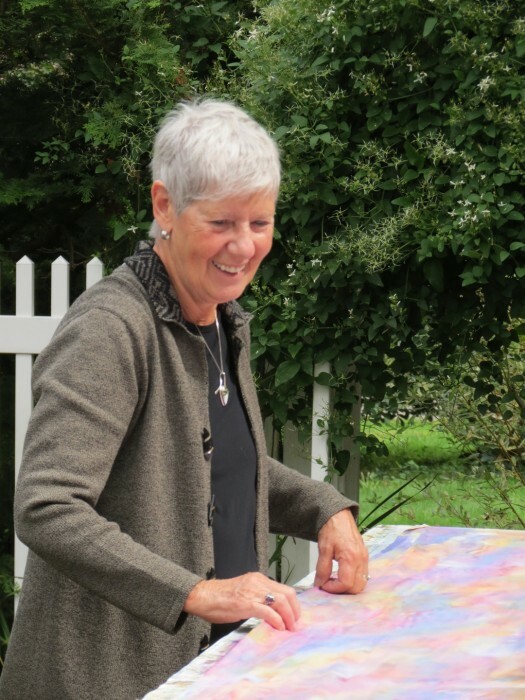 Mickey shows off her painting outdoor painting tables. Soon, it will be time to move everything indoors for the winter. Look at that gorgeous fabric, all stretched out in the autumn sun! After checking out the outdoor painting area, we moved indoors to Mickey’s studio to look at her works in progress. 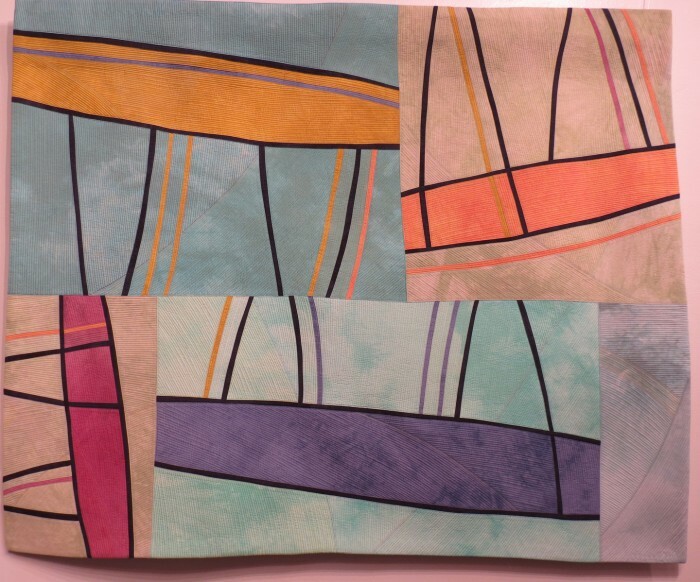 She’s currently working on a series of small quilts that will be framed for sale in a local gallery. And lastly, after a cup of tea and a good chat, we got to touch and feel, and BUY some of her incredible hand-painted fabrics! 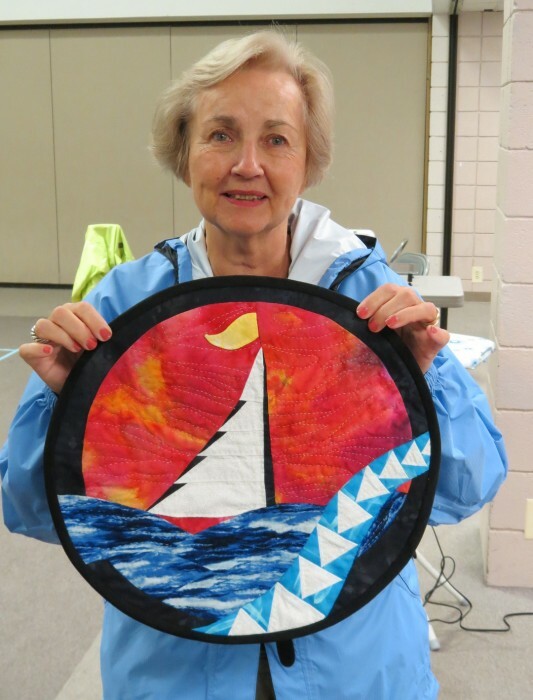 Gayle Brown, Connecticut Piecemakers, shows off one of the newer style painted fabrics – Sand Painting! What a fun day that was! I have a feeling that there are many fun adventures in store for me up here in New England!